Oral & Maxillofacial Associates of Oklahoma offers dental implant services in Oklahoma City, Norman, Midwest City, and Edmond, OK. To schedule an appointment call 405-848-7994 (Oklahoma City), 405-292-8900 (Norman), 405-733-4296 (Midwest City), or 405-341-4022 (Edmond). At Oral & Maxillofacial Associates of Oklahoma, we are board certified in oral and maxillofacial surgery. We have placed more than 13,000 dental implants at a rate of approximately 1500 per year. We work closely with your dentist or prosthodontist to seamlessly coordinate the placement of your implants with your final restoration. Dental implants are, in effect, artificial teeth roots. 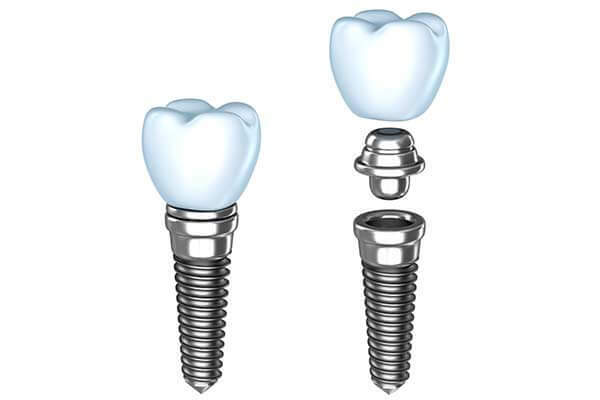 A dental implant is a small titanium screw that is surgically implanted into the jaw, below the gumline. The implant serves as an anchor to which an abutment is attached. Your dentist will place the abutment, which connects the implant to the replacement tooth. 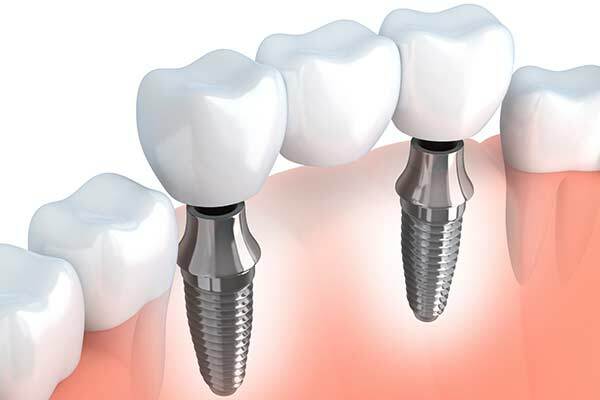 The abutment screws into the dental implant and acts like the root under a crown of natural tooth, except that it is stronger and is not susceptible to decay. A single dental implant topped with a crown is a great solution for a single missing tooth. Dental implants are strong, retain bone structure, and are as easy to maintain as real teeth. A top quality crown blends seamlessly with your natural teeth, creating a highly aesthetic and functional smile. Traditional dental bridges require the natural teeth at each end to be shaved down and prepared for crowns. They are prone to failure either because the supporting teeth can no longer support the bridge or the cement holding the bridge leaks. Either situation can cause decay and further tooth loss. 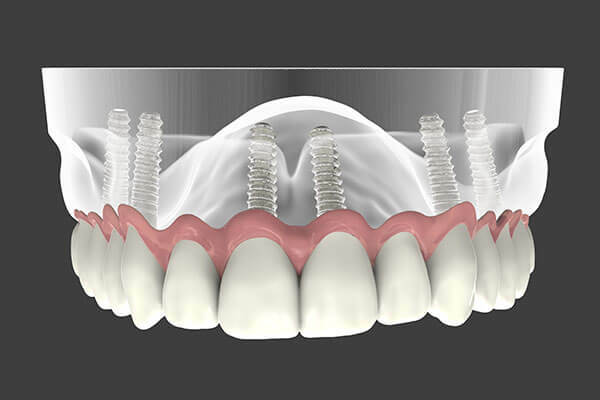 When a dental bridge is supported by dental implants, the surrounding teeth are left undisturbed. There is no enhanced risk for additional tooth loss caused by the strain of conventional dental bridges. If you are missing all of your teeth on the upper or lower arch, just two dental implants can stabilize a removable denture, or a handful of implants can support a full bridge of fixed replacement teeth that never leave your mouth. In fact, a special procedure has been created by Nobel BioCare to address this issue. The procedure is called the All-on-4® Treatment Concept. At one time, dental implant placement was tricky and imprecise. Today, state-of-the-art guided surgical techniques allow us to use keyhole surgery to precisely place and position your dental implants. This means that minimal soft tissue manipulation is required, and both pain and healing times are significantly reduced. The conventional dental implant process can take from three to six months. We will coordinate with your dentist to create a temporary prosthesis such as a partial denture for you to wear from the time we place your implants until they are fully integrated with the jawbone and ready to receive your permanent restoration. Immediate-load implants, such as the All-on-4, bypass this process. They are designed to take the forces of biting and chewing right away, so you can receive your final restoration on the same day that your implants are placed. Which procedure we use depends on several factors, including your overall dental health, the number of teeth involved, and which teeth are replaced. These factors will also determine the total number of appointments you will need with us throughout the treatment period. The fee for dental implants depends on several factors, including the number of teeth being replaced and the number of dental implants required to support your replacement teeth. Some additional procedures, such as bone grafting or a sinus lift, may be required prior to the placement of your dental implants to ensure the best results. We will conduct a thorough examination and create a detailed proposed treatment plan with a breakdown of costs. How does the cost of implants compare to the alternatives? It is true that implants are generally more expensive up front, but when amortized over a lifetime, implants are almost always the least expensive solution. They can also save you money in future dental procedures. We will schedule you for periodic checkups over the months that your mouth is healing. After your implants are fully integrated with your jawbone, you will only need regular visits with your dentist for routine cleanings. The result of dental implant placement is a brand new, long-lasting smile with maximum comfort, support, and functionality. Most importantly, patients will walk out of our office with a boost of self-confidence and an irresistible urge to smile more often. To obtain that healthy, white smile you have dreamed of all your life, come see the experts at OMA for dental implants. Our surgeons are board-certified, not just licensed. We offer the most innovative treatments available. Our professional and friendly staff will guide you through your treatment. OMA surgeons have placed more than 10,000 implants with a high success rate.